Blinging out your golf cart used to mean commissioning a personalized paint job or installing a stereo in the dash. Not anymore. Today's bespoke carts, complete with aerodynamic wings, iPad holsters and sticker prices approaching six figures, are unabashed showpieces that have attracted A-list owners like Will Smith and Adam Sandler. Here are a few of the coolest, and costliest, carts on the road -- and path. This base model is the easiest Garia to get your hands on. It's offered in three exterior colors (white, cream or red), three seat colors (oak, walnut or cherry) and has eye-catching 10-inch wheels. Much more than your standard E-Z-GO, the base model comes with LED taillights, a 12-volt power outlet, turn signals and ample storage space. 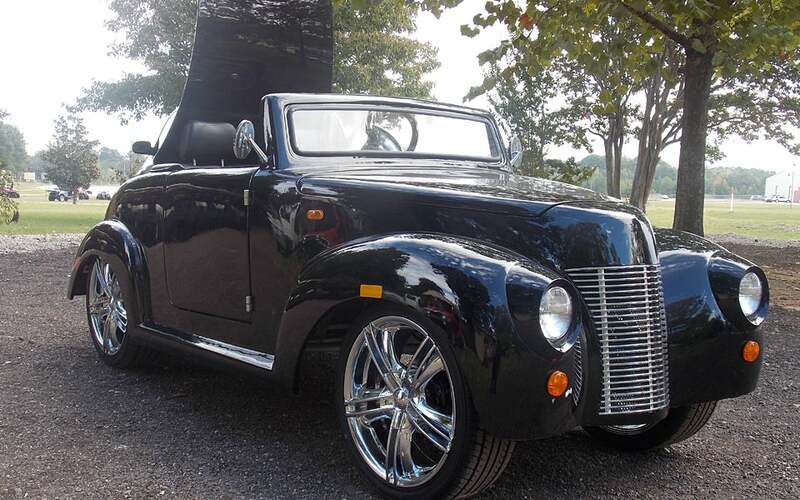 Evoking an antique Rolls-Royce, this black beauty has shock absorbers and a four-wheel braking system (with front-wheel hydraulic disk brakes), plus headlights, taillights, brake lights and turn signals. It also features a 48-volt battery system and several custom options, including flip-down monitors as part of a full multimedia system. Pennwick, one of the world's largest golf cart customizers, counts celebrities like Will Smith and Adam Sandler among its clients. The Brooklyn, which bares a close resemblance to a Bentley, brings luxury to the course. It comes with headlights and taillights, turn signals, side mirrors and a 48-volt charging system. Among the available add-ons are a chrome tilt steering column and an Alpine stereo. Pennwick's sportiest offering channels the aerodynamic and glossy design of a Ferrari. The cart is available with customizable options like a gas-powered chassis, leather seats, hard top and a golf bag holder, which we all know is the most important part. There's also a stereo package available, if you want to crank up the bass while riding on 15-inch rims. The only downside? The cart maxes out at 20 mph; not exactly Ferrari-esque. You better have some serious game before taking this baby out on the course. The Golfmobile, as we're calling it, has adjustable leather seats, an iPad stand and headlights. It also features an all-black alloy body, twin aerodynamic wings and a 4-link rear suspension for a supremely smooth ride. But what's a Golfmobile without speed? 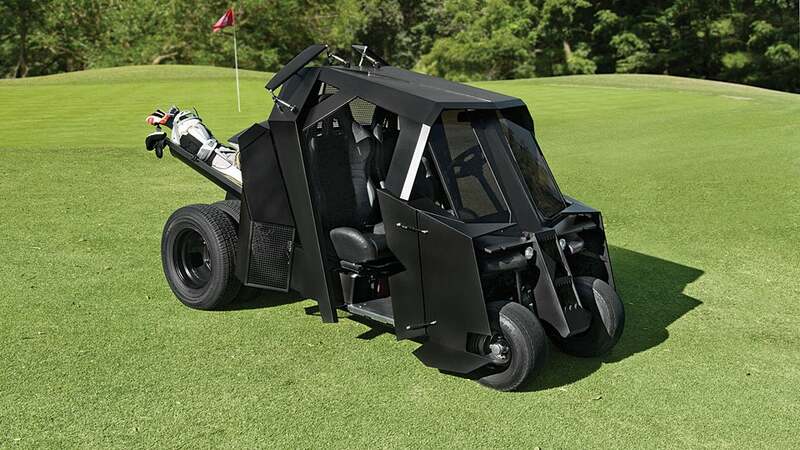 The Gotham golf cart reaches 38 mph, just fast enough to fight on-course crimes, like slow play. The Soleil de Minuit debuted in 2010 at the Top Marques car show in Monaco. At the time, it was Garia's most expensive model. Many of the accessories available in 2010 were rare and unique, such as a carbon-fiber roof, Lamborghini pearl paint, black floor rails, etc. Garia considers the Soleil de Minuit as a turning point in the company's manufacturing and design processes, as many of these unique accessories became options on every Garia model made. The two-time Masters champion made noise in 2014 when a video surfaced of him behind the wheel of his newest toy. An Indiana-based company called Neoteric Hovercraft built the vehicle, which is available for purchase on the company's website. The golf cart -- maybe golfcraft is more apt -- has four seats, a beige gel-coat finish with matching seats and a 65 HP fuel-injected engine. It can travel up to speeds of 65 mph and navigate all kinds of hazards. Talk about a limited edition vehicle: Garia manufactured only seven of them, with some assistance from Mansory, a custom detailer known for its work with brands like Bentley, Bugatti and Ferrari. The Currus features an adjustable setting for maximum motor braking and battery regeneration package that lets the car charge while it's being driven. It comes with three driving modes (Golf, Street and Race) and can reach speeds of up to 37 mph. Mercedes garnered plenty of attention when the company unveiled this concept for a golf cart in 2013. The cart looks more like a futuristic, street legal vehicle, though it does have a designated place for your clubs. It's controlled by joysticks between the driver and passenger seats and is powered by batteries charged by solar panels installed on the roof. The prototype also features a touch-screen controlled media system and a “Fore” button to warn other golfers of a wayward shot. Still in development, this cart does not yet have a price tag. Expect anything less from “Money” Mayweather? Floyd apparently bought this cart for his son Koraun's 15th birthday. The boxer has a reported net worth somewhere in the $300 million range, and we'd guess this cart cost him at least 20 large. Details about the cart's specs are unknown, but it's nice to see it has canisters for grass seed. Or do they hold gold dust? Either way, this cart is a knockout. It is what it is: Coolest. Cart. Ever.